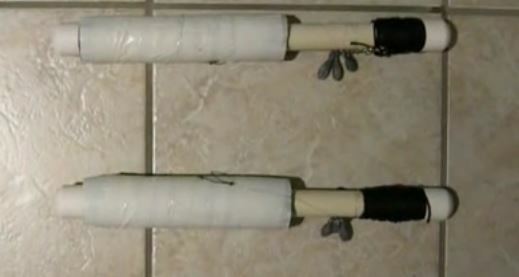 PVC Pipe Fishing - Float Fishing Made Easy! PVC Pipe Fishing – Float Fishing Made Easy! Fish are one of the most abundant foods in existence. Virtually they can be found wherever people live and if you're able to catch them this is one way of ensuring a food source, especially when faced with a survival situation. One method of fishing is “float-fishing,” where you attach a line and hook to a milk jug and wait until a fish comes along and takes your bait. The jug serves as a type of giant bobber you can easily locate, especially if you are fishing at dusk or in the dark. If the body of water you are fishing has a current, however, a floating milk jug could quickly get beyond your reach. By using this amazing PVC floating set-up, you can anchor your rig to the bottom, and it will serve as a beacon once you hook a fish. To see how to make this simple, but very effective fishing rig, check out the video on the next page. I’ve been doing this for years. It’s not only easy, but fun! Jug fishing is the lazy man’s way to fish… Works well… You can set up camp, forage, whatever and your jugs are working for you.